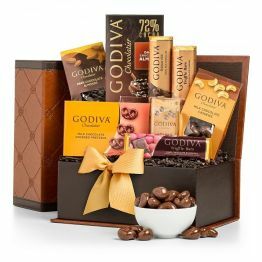 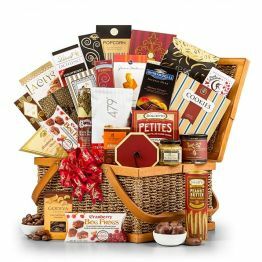 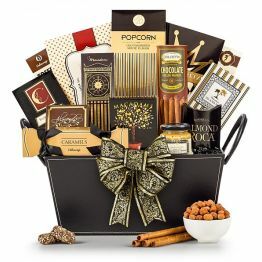 Grandest Gourmet Premium Gift Basket (USA Only)GT38Our largest, most extravagant gift basket of delights! 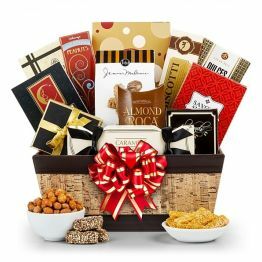 Our largest, most extravagant gift basket of delights! 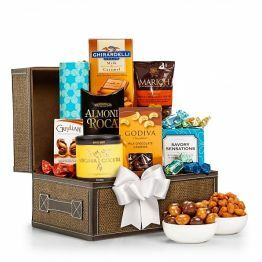 This hamper will earn you 272 Hamper Points. 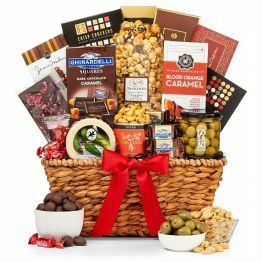 Caramel Almond Popcorn 4oz, Aaron Bell Pretzels 4oz, Premium Coffee Blend 1.5oz, Macadams' Chocolate Chip Cookies 4oz, Jumbo Toffee Peanuts 4.9oz, Macadams' Island Mix 2oz, Pacific Gold Pistachios 2oz, Dolcetto Chocolate Wafers 5oz, WVM Sweet Hot Stone Ground Mustard 3.25oz, Sun Dried Tomato Pesto Cheese Biscuits 1.5oz, Moravian Cranberry Orange Cookies 2.75oz, Caramel Almond Popcorn 4oz, Premium Dip Mix 1oz Godiva Dark Chocolate with Raspberry 10oz, Cary's Trail Toffee 7oz, Godiva Chocolate Covered Cashews 2oz, Cranberry Bog Frogs 1.9oz, Moonstruck Dark Chocolate 3oz. 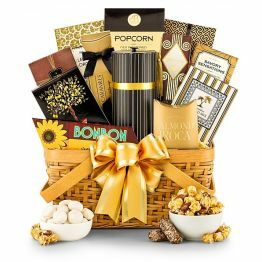 Presented in a Wood Framed Woven Basket.